You’ll never guess what Joseph’s first request was: pizza! 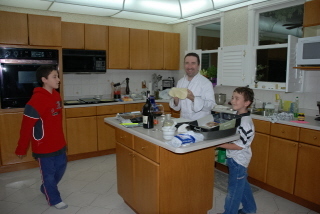 Since we starting this, over the summer in 2005, Joseph has gotten a few paying gigs to make pizza. Way to go, Joseph! Anyway, here’s a bit about the first time all three guys went into the kitchen together to cook. But the results were definitely worth it, if messy.